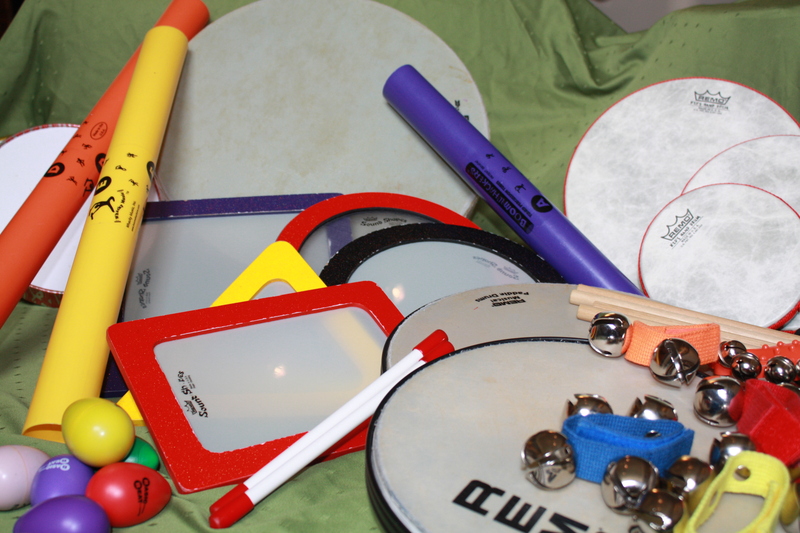 As a music therapist providing services at multiple sites, I require instruments that are easy to pack, clean, and don’t weigh tons. Living in an area of wind and other weather events, I try to approach my sessions with a one trip in and out load. My rolling suitcase & shoulder drum bags are my helpers. In addition, I need items that can appropriately work for the ages with which I work: preschoolers and older adults. My guitar is my traveling accompaniment instrument and most of the facilities I service have a piano I can use. Here is a list of some of my most used instruments for clients. I’ve provided links to West Music (not an affiliate) for those who are not familiar with these instruments. Resonator Bells: These break my rule on light weight. I inherited them from my parents. As they require rebound and striking at a particular point, it involves a coordination to obtain a nice sound. With adults, I have used them as they are individually small and allow us to work on these skills. With children I have used to discuss size along with concepts of high and low sounds. As the letters on my set are difficult to read (unlike the sample picture), I have often taped larger print ones to the base when using them for letter recognition. Egg Shakers: These easy to clean instruments come in several sizes and some with handles. I store them in a net washing bag for easy transport. The uses are so numerous, I won’t even attempt to list them here. Wrist Jingle Bells: Oddly enough, a fair number of my older adults select this instrument when it is offered as a choice. I suspect it is because they are familiar, light weight and wearable. With preschoolers, we use them for lots of horse and color songs. These are my most difficult to clean instruments. Nesting Frame Drums and Paddle Drums: The space-saving feature of these drums is great! They work well with and without mallets. With preschoolers I have the ability to compare sizes (as I did with the paddle drums in the post on the Jazzy 3 Bears). Older adults are able to select the size that best fits their lap or strength. I also use the Paddle Drums with older adults. These can be clamped to an armchair if required. Are there other easily transported instruments in your bag of tricks? I’d love to hear about them.